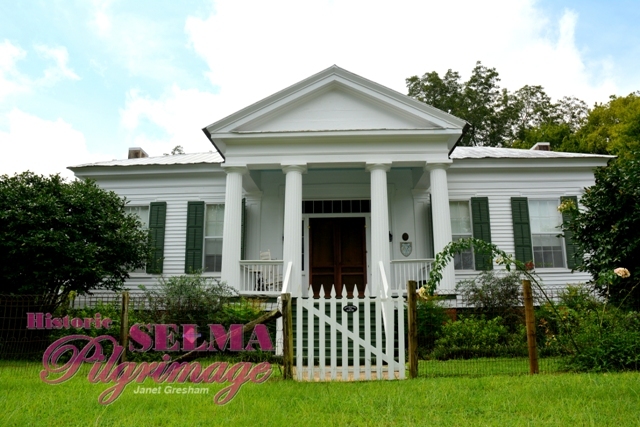 The 43rd annual Historic Selma Pilgrimage, presented by the Selma-Dallas County Historical Preservation Society and the City of Selma, March 16-17, 2018, showcased exquisite home and building architecture, fabulous art, an in-depth investigation of Selma’s pivotal role in the American Civil War and the Civil Rights Movement combined with Southern hospitality beyond compare. Pilgrimage patrons delighted in the magnificent visuals during the weekend events. Morning houses included both antebellum and Victorian. 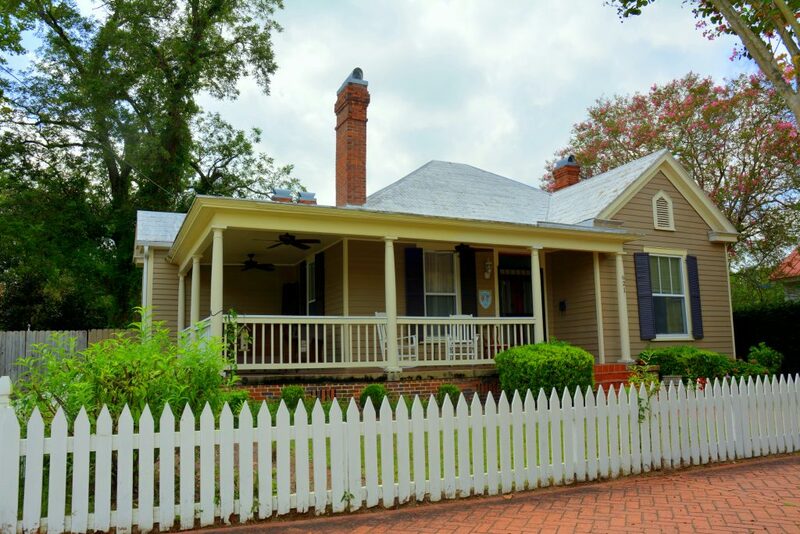 The 1860 Parke House is an outstanding Greek Revival with modern renovations such as a seven-car garage and chef’s kitchen. The 1910 Strand Cottage and 1865 McEachern Cottage are both in Fairoaks Square, an Old Town neighborhood that was renovated in the 1980s. 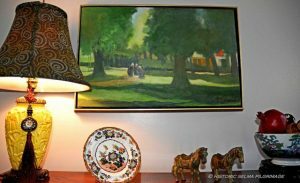 The Strand Cottage has a modernized interior that is filled with antiques, collections and art, some of it the owner Anne Strand’s own work. 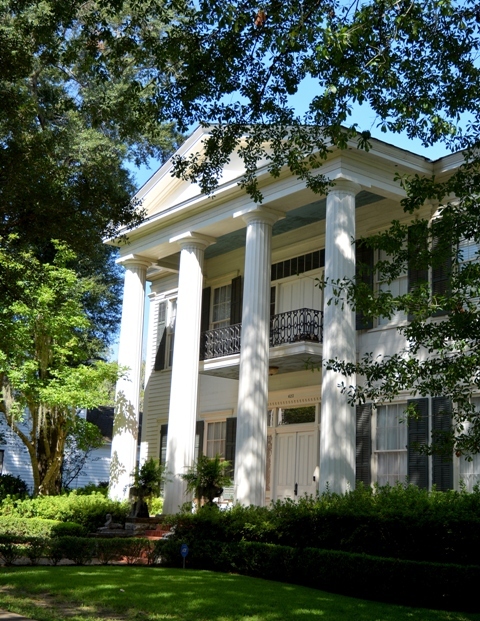 Afternoon houses were all antebellum, beginning with the Platt-Lewis-Gayle-Linden House in downtown Selma. The Italianate was saved during the Battle of Selma and features lovely collections from the owner’s childhood home in Greenville where both her father and grandfather were physicians. George and Kathi Needham will be hosts at the mill house at Kenan’s Mill. Kenan’s Mill, an 1860’s gristmill that operated until the 1970s, will grind meal in the afternoon, and cornmeal can be purchased. Wandering troubadour Paul Garner sang and played his guitar, and pilgrims toured the mill house, a charcoal kiln, walked a swinging bridge across Valley Creek and enjoyed the park-like grounds. 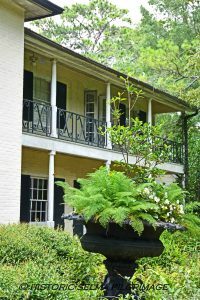 Descendants of the original owners and builders of Kenan’s Mill opened the old Kenan Place, an antebellum home with an interesting story of the Civil War. Kenan’s Mill and the Kenan home were on the way to the antebellum Moore-Pinson-Tate-Hudson Home and the Methodist Church in Summerfield. Friday night’s house was truly a treat. 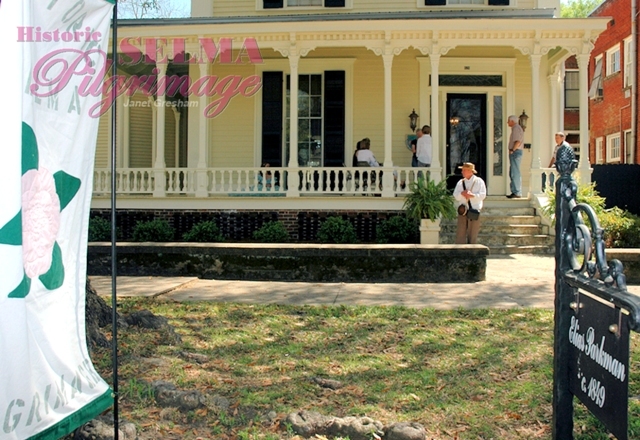 The Hohenberg-Jones-Hobbs House was open to pilgrims with wine, punch and snacks at the end of the tour. This mansion, built in the 1930’s, has been fully restored and modernized to accommodate luxurious modern living. 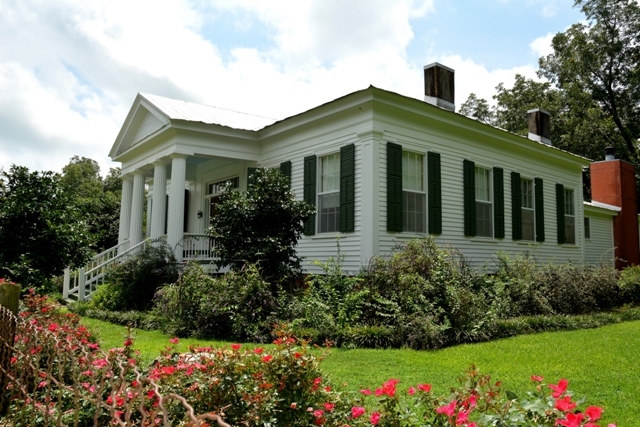 The Parke House (circa 1859) is an antebellum mansion originally constructed as a wedding present for Louisa and Dr. Clifford Daniel Parke by Mrs. John Swift, Louisa’s mother. Dr. Parke was from North Carolina but lived and practiced medicine in Selma from 1852 until his death in 1886. He was president of the Alabama Medical Association and a member of the Selma City Council. The house was constructed by slaves using old growth heart pine as three rooms over three rooms laid out in the shape of an L. It was built in the Greek revival style but underwent extensive remodeling near the beginning of the 20th century when Victorian and Edwardian elements were added to its interior. The original staircase was replaced with a magnificent early Neo-Classic stairway of turned oak. Stained oak wainscot, double doors and trim were also added to the central hallway. The lovely beveled glass sidelights and transom are believed to date from this restoration. The house retains four of its original gas chandeliers and has five bedrooms, eight fireplaces and six bathrooms in its present form. The free standing brick kitchen remains and was expanded into a nine hundred square foot outbuilding in the 1980s. 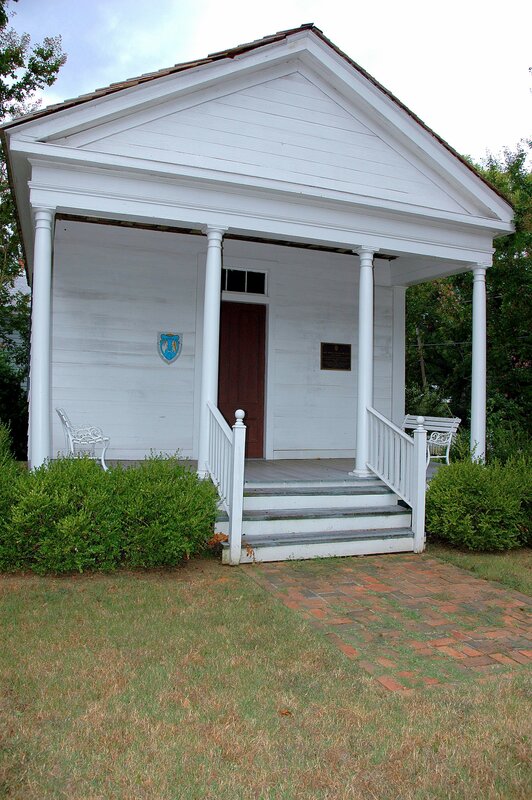 A two-room slave quarters also survives and was moved and incorporated into the main structure. A New Orleans style brick courtyard was added as well during renovations in the 1980’s. Most recently a seven-car garage was built using antique bricks in 2008 and a modern chef’s kitchen was completed in 2012. The house is currently furnished with period antiques. One of the Fairoaks Square houses, mainly Victorian cottages, that were restored in the 1980s. The Square is named for “Fairoaks,” now Henderson House, the 1855 Greek Revival mansion down the street. 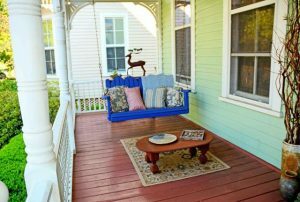 The once beautiful and thriving turn-of-the-century neighborhood were in a deplorable state of repair when they were purchased in 1980-81 by Circle “S” Industries, Inc and renovated. For this project, the mansion and twelve Victorian cottages were reclaimed and restored. The endeavor received much national acclaim and an Honor Award from the National Trust for Historic Preservation. This cottage gains curb appeal from a quarry-tiled wraparound porch with seven Doric columns that gives this house a true southern flavor. Double French doors open into the formal entrance parlor with its corner tiled fireplace encircled by a heavy oak mantel with Corinthian columns. 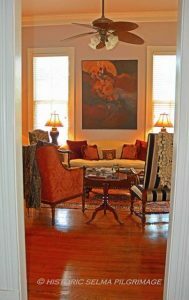 A wide opening joins the parlor with the formal living room. Here, a mahogany mantel with beveled mirror creates the setting for the corner tiled fireplace. Pocket doors separate this room from a formal dining room with detailed chair rail, oak-columned corner fireplace, and two massive side windows. No contemporary comfort was sacrificed during the renovation of the kitchen and breakfast area. A tremendous walk-in pantry is located here, four feet deep, eight feet wide, and ten feet high. A separate laundry room with storage is opposite the pantry. The kitchen maintains the original hip-vaulted ceiling and tongue and groove walls. Made larger by a wide walk-through, the breakfast area is accented with a brick tile floor and double French doors opening to a 12′ x 18′ brick patio. A central hallway with pine wainscoting, stripped to its original finish, leads to the private master bedroom. This room features a massive oak manteled fireplace with beveled mirror, Corinthian columns, and Greek detail. 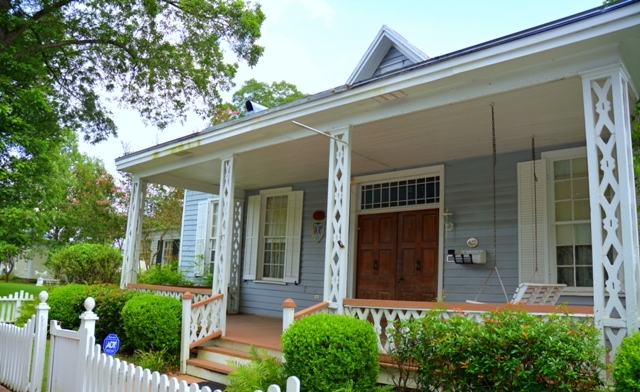 The Strand Cottage in Old Town Selma was built between 1899 and 1901. It is nestled at the end of a row of four Victorian dwellings in Fairoaks Square. Architecturally the cottage is crafted in “Carpenter Gothic,” a derivative of the Gothic Revival style popular for churches and colleges in the 1800s. This style was much lighter, smaller and less expensive than Gothic Revival and was typically made of wood rather than brick or stone. 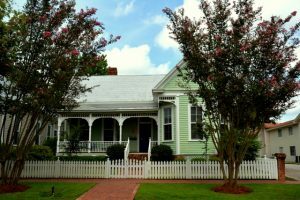 Carpenter Gothic homes typically featured: steeply pitched roofs and gables, fancy scroll work and gingerbread, barge boards, carved porch railings, and window trim mimicking the masonry trim of English Gothic cathedrals. All this was done on simple country cottages as is seen on this one example. During the 1980’s restoration, the house’s exterior was authentically restored while the interior was modernized to retain many of the original features, such as the deep moldings, interesting millwork and period fireplaces. Today the interior is filled with inherited antiques, the Strand’s personal art collection and artist Anne Strand’s own art work and decor. Anne and Allan Strand moved to Selma three years ago to be with their daughter, AC Reeves and her family. 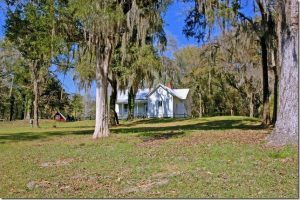 Since planning their move they have bought “two” one-hundred-year-plus properties—the Bridge Tender’s House and this Fairoaks Cottage—and have thoughtfully added to their continued preservation. 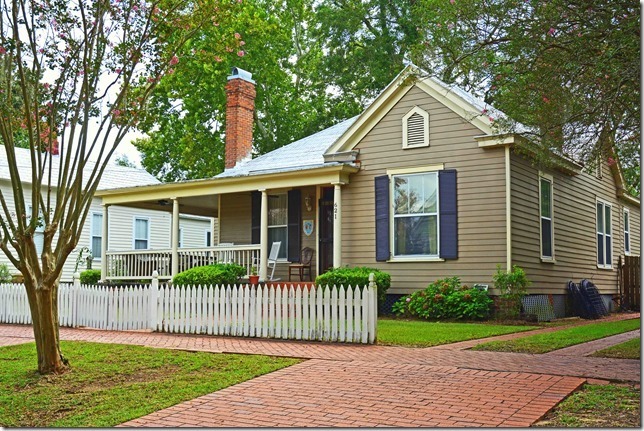 Miss Minnie Sue’s Cottage is as charming as its name. The decorative medallions on the parlor and wall ceilings, the wainscot in the parlor and the plain woodwork are all clues to its 1830s construction. All lumber is heart pine and is hand hewn and pegged. 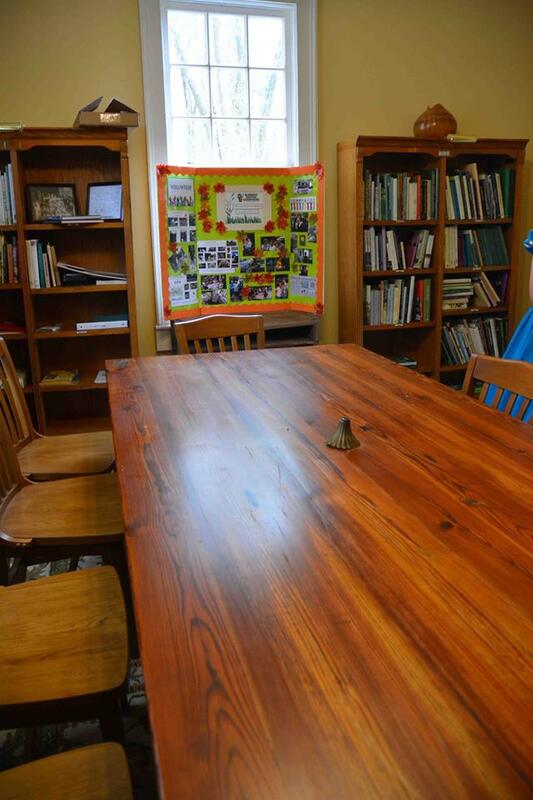 All doors are heart pine, walls are horsehair plaster and the floors are 1 3/8″ heart pine. Ceilings are 12 feet and windows vary from nine over nine to six over nine, most of them have original glass still and are held up by matched pieces of wood rather than weights. The house was moved about 1910 to its present location. At this time the hall and the four front rooms were the original house and the kitchen and master bedroom were actually little houses of the same period that were attached. The house was purchased by the Selma-Dallas County Historic Preservation Society around 1976 and then bought by Chris Vaughan for her antique business. In 1983 the Vaughans made this house their residence after another renovation. The back part was added on with a sundeck that duplicated the front porch. One big room was added and divided into four: bath, utility room, sewing room and closet. Many of the rooms are 17 x 17 feet. The coal burning furnace was only 11″ wide, but it worked. This house was recently donated to the SDCHPS and will have various actors portraying many important Selmians relaying some of their personal tales of woe and triumph. 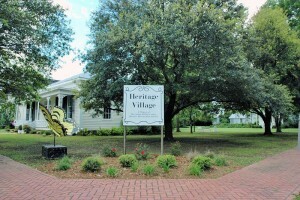 Some actors will also be next door in Heritage Village, the site of several 1800’s structures that were also donated to the SDCHPS by private individuals. Included are four relocated historic structures: McKinnon-Riggs doctor’s office, 1830 Calhoun law office, Siegel servant quarters and a historic pigeon cote, as well as displays of 19th century equipment and furnishings. Thanks to a Masonic pin, a Union lieutenant decided to spare this pretty house during the last days of the Civil War, but the story of the Yankees’ visit doesn’t stop there. 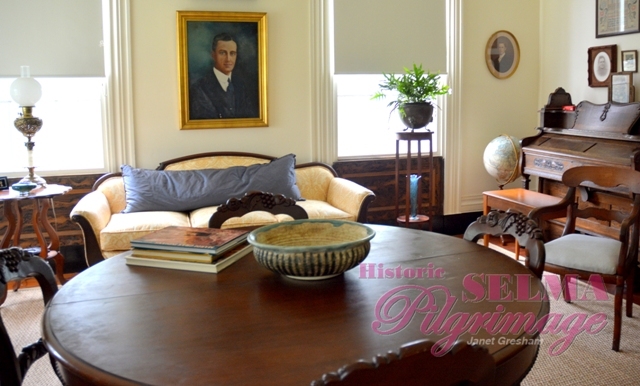 Pilgrimage visitors to the Platt-Gayle-Linden House will hear how the story ends when another military man coincidentally visited the house 100 years later. Built in 1849, the gracious Italianate home has been beautifully furnished by owner Shannon Linden and restored by its previous owners, Cecil Gayle and the late Ken Parker. Carved eaves and cornice brackets are original to the house, and a charming, Victorian octagonal addition was built around 1900. Mrs. Linden, known by many as “The Silver Lady from Atlanta,” is a relative newcomer to Selma although she grew up in nearby Greenville. She “fell in love” with the house during a Pilgrimage when she participated in the antique show. 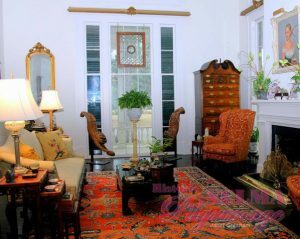 Using family heirlooms along with a few oriental decoratives, Mrs. Linden has created a colorful, inviting interior. In the living room, a small, leaded glass window from her grandmother’s historic home in Mobile, hangs to catch sunlight. Although her grandmother’s home was torn down, she saved some of the carved wainscoting, which can be found throughout the house as wall hangings. She also framed a portion of her intricately embossed, cathedral wedding veil. Upstairs, art collections include a wall filled with rare Japanese Imari porcelain fish plates and another that features views of her childhood home. A bronze sign that was original to the Stabler Infirmary in Greenville is Mrs. Linden’s favorite piece. Both her father and grandfather were physicians, and the L.V. Stabler Memorial Hospital in Greenville is named for her grandfather. 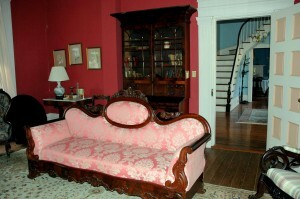 In the guest bedroom are a cherry wood, four-poster bed with Victorian mahogany bed steps, a four-poster doll bed that Mrs. Linden had as a child, an unusual rocking rooster baby rocker, a rope baby bed and her parents’ invitation from President Franklin Roosevelt to a White House reception in 1939. Simplicity is the time-honored style of this antebellum home in Summerfield, except for the attractive, original faux graining on wainscoting, doors and panels. A covered walkway leads to a gazebo and park-like grounds. This Greek Revival home has a columned portico, symmetrical center hall and four rooms with fourteen foot ceilings in the original house. Very interesting original faux graining on front hall wainscoting, below-window panels in rooms and doors in the original house. The addition in the rear includes a large kitchen, family room, and screened porch. Original heart pine floors were unfinished until a renovation in 1984. There is an ornate German turn of the century chandelier in front hall. Some furnishings from 1840s -1850s. One bedroom suite is Eastlake (1879-1880); the master bedroom bed is Renaissance Revival (1880s-1890s). The ornamentation is quite plain with some reeding on the parlor moldings but the bedrooms have the typical Greek Revival battered, eared door surrounds. Originally the back part of the hall, now the dining room, was open at the back as a dogtrot. The walls are painted heart pine boards. The bedroom doors opened on to this area. When the front and back doors are open it creates a very effective breezeway. The owner’s grandmother remembered roller skating in this area. She was born in a house which was on the adjacent lot to the south. 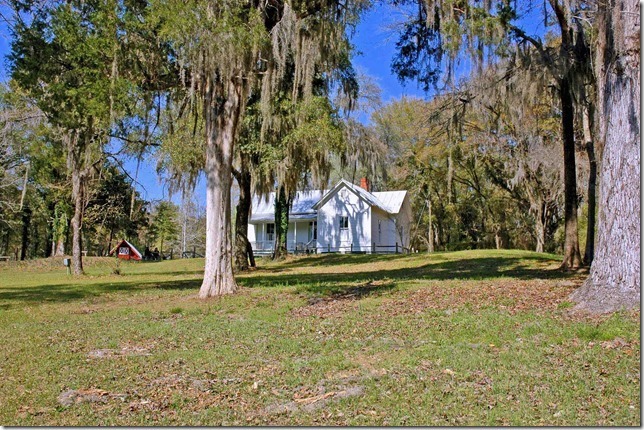 When it burned she moved in with her relative Edna Earle Tate and was raised in the house. 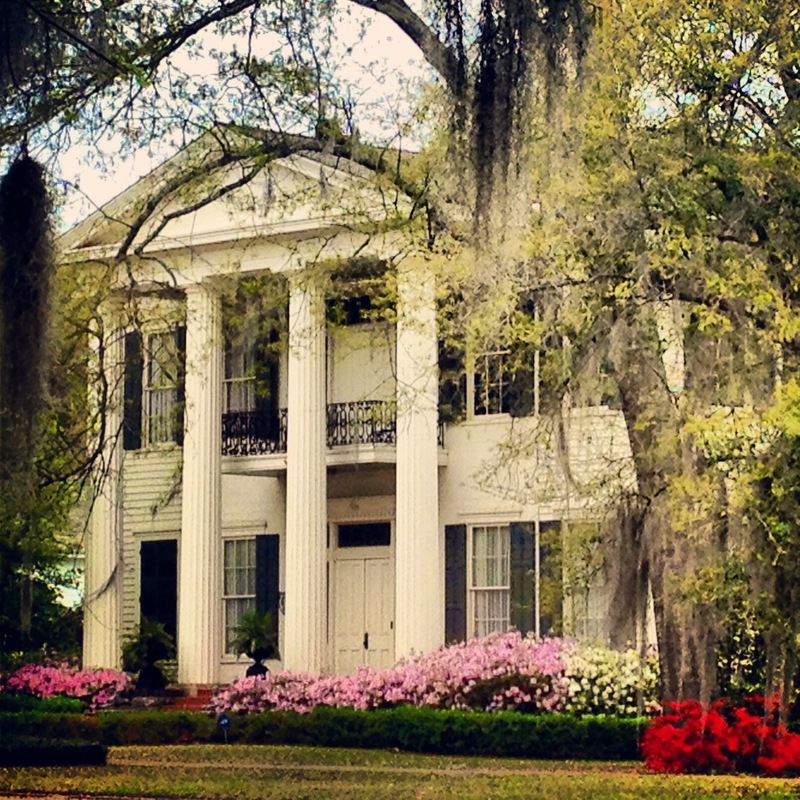 She and her husband, William Hudson, Sr owned it after Ms. Tate’s death and retired here. Their son, William Jr. retired here in 1984 and the current owner, his son, is retired here. The Kenan Place on Summerfield Road is one of the oldest homes in Dallas County. Built in 1826, the two-story Greek Revival has wings on each side of the Doric-columned portico, giving it a Federal appearance. 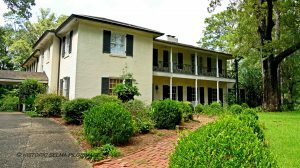 Owned by the Kenan family since 1854, the home bears scars of the Civil War after it miraculously survived a fire set by Union troops in April 1865. Kenan Place was built by Dr. Algernon Jeffries between Selma and Summerfield. He used lumber from the property to construct this house upon a hill which served as his home base for a medical practice. 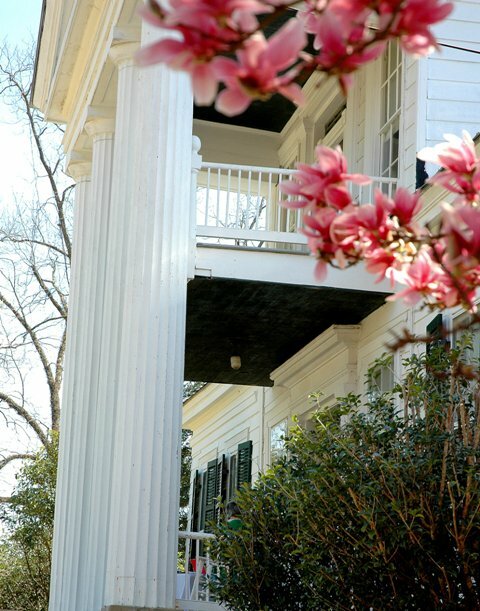 The home changed ownership several times, including purchase by the prominent Lapsley and Pickens families, until it was bought by Daniel Kenan in the 1850s. When Union Gen. J.H. 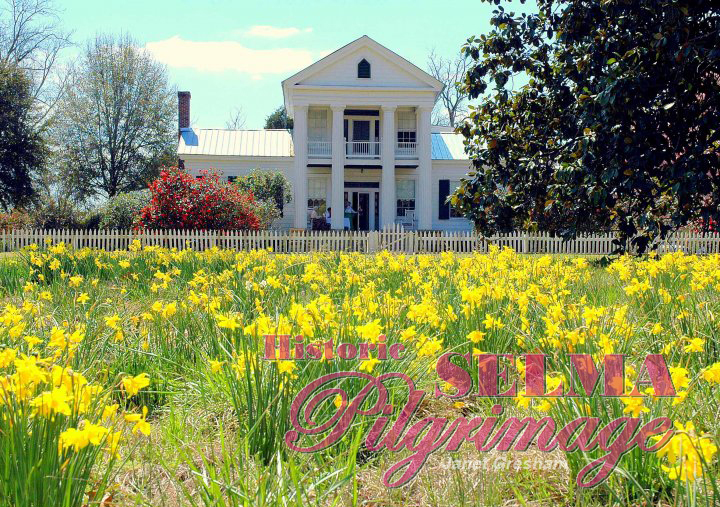 Wilson’s troops swung south through the Summerfield area on their way to Selma, the Kenan Place was found unoccupied, and the federal cavalry piled broken furniture into the parlor and set it on fire. After leaving to march the last few miles to Selma, it is said that servants came out of hiding and put out the fire. A large charred area is still quite visible in front of the parlor fireplace. During the 20th Century, the home was modernized with a kitchen, breakfast room and master bedroom, but most of the house remains original with heart pine floors and an attractive entryway staircase. The large picket-fenced yard is filled with native plants including camellias, azaleas and English boxwood. Kenan’s Mill remains one of the most interesting historic sites in Dallas County. Restored in time for Kenan’s Mill Days of Pilgrimage 2002, the first bag of corn was ground into meal on March 16 of that year. Water again spills over the dam and extensive landscaping by the Master Gardeners has restored the area to its native beauty. The cottage on the hill across from the mill is from the early 1900’s. It was a tenant house, not the miller’s house as it is sometimes called. The house received its water by a ram which pumped water from either a spring or artesian well. The ram was located on the property near the mill and was found during the restoration. The Artesian well stopped flowing many years ago as the water table dropped. It was located on the bank to the left of the mill. This cottage, renovated in 2007, now houses the horticultural library and provides a meeting place for the Dallas County Master Gardeners and Historic Society. The Master Gardeners created a demonstration garden next to the cottage and planted perennials and “pass-a-long” plants in surrounding beds. 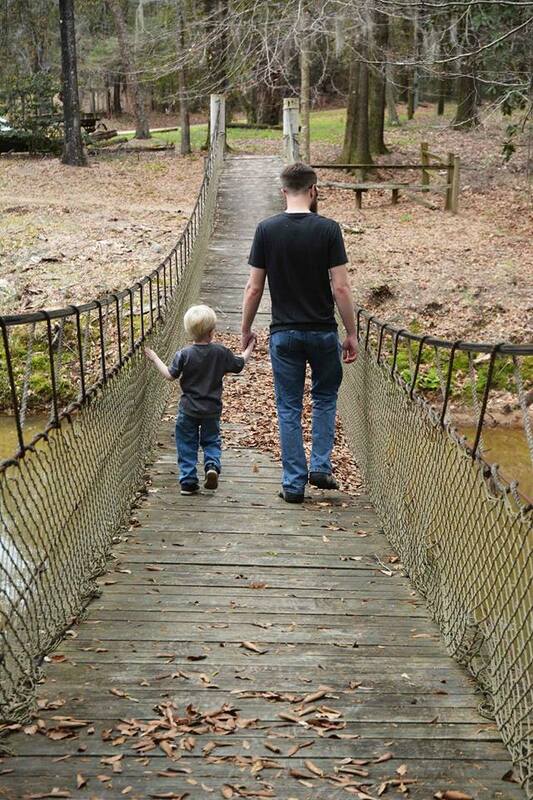 Originally the miller lived across the creek and this was the reason for the first swinging bridge. When farmers came with their grain to be ground, they would ring the bell by the door of the mill, and the miller would come across the bridge to grind the grain. That residence is no longer in existence. Many older residents tell stories of taking their grain to the mill to be ground into meal or grits. Apparently, some went on Friday night and slept under the wagon so they would get an early start on Saturday morning. With a mule-pulled wagon, the number of miles that could be traveled in a day was limited. 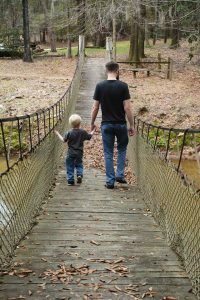 Thus there were quite a few mills along streams in the early days in Alabama in order to be within reach of the public. As times changed and people no longer grew their own grain and took it to the mill, one by one, these mills closed and most have ceased to exist. 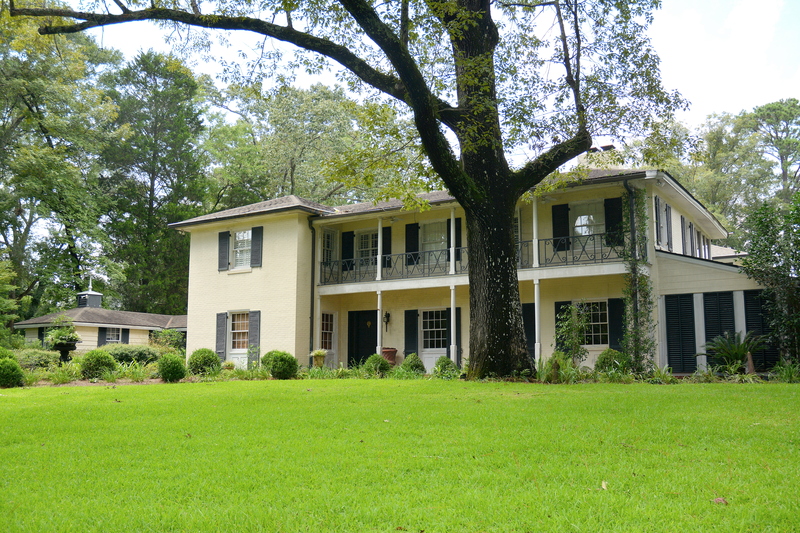 “The Hill” was designed by the Birmingham architectural firm of Warren, Knight and Davis for Charles (Chuck) and Alice Armstrong Hohenberg and built in 1940 on land belonging to the Armstrong family and given to their daughter Alice. Here the Hohenbergs raised their three children, Mina, Charles and Alice (Al). Mr. Hohenberg died in 1984 and Mrs. Hohenberg continued to live in the house until her death in 1996. The “Big House,” “Little House” and surrounding 20 acres were purchased in 1998 by Larry and Edie Jones who left most of the house true to its original design except for renovating the old kitchen; they enjoyed living in the home until the back portion was destroyed by a fire in January 2003. The present owners moved into the house in 2008 after restoring the burned areas, adding a new garage and elevator and enclosing with glass the original extensive screened porch. Many of the big oaks from the original landscape plan still shade the grounds. Mrs. Hohenberg loved gardening and Mrs. Hobbs has continued her tradition, relocating old shrubs and planting new ones. 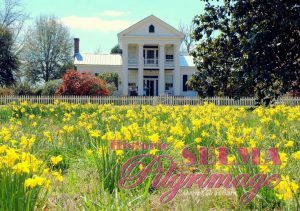 The sloping hill in front of the house blooms with daffodils in the spring and spider lilies in fall and the Louisiana iris in the bog along the north side of the drive flourish in May. Now ginger lilies bloom in late summer along the east side of the drive and scattered throughout the bog. Mrs. Hobbs renamed the house “LysHill” for her favorite flower, the iris – especially its stylized form the fleur-de-lys.